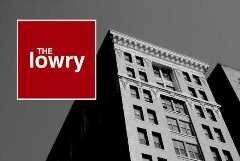 The Lowry was built in 1911 by Thomas Lowry and is located at 350 Saint Peter Street, directly across the street from the Saint Paul Hotel. It is a downtown landmark that has been transformed into twelve floors of loft condominium living. Each unit has terrazzo or concrete floors, exposed duct work and plentiful, large windows for lots of daily incoming sunlight. The building has two floors that are connected to the skyway allowing for a short walk to urban retail and some of Saint Paul’s finest restaurants includingPazzaluna, Sakura’s which are located on the first floor and The Saint Paul Grill and Kincaid’s which are both just across the street. One of the nicest aspects of its location is that it is just steps from the always pleasant Rice Park.